I intended to try to take a better matching photo but this is the closest I got. He’s supposed to be fast growing but not as fast as I hoped. I researched about fertilizer or any other tips for things I could do but apparently making sure he had enough water in the summer and shoring him up in a leaf pile for winter is doing the best. That reminds me, I posted a photo of the house behind us. They had to chop down their trees. 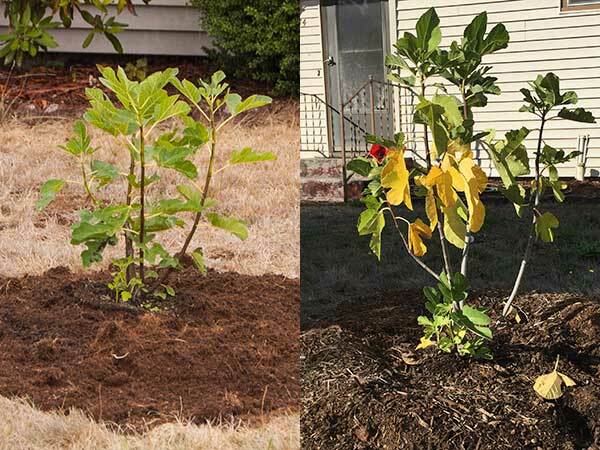 The neighbor told us that Friends of Trees was going to plant new trees and gave them a bunch they could choose from. His mother-in-law was fretting about what to choose and Donny told her: They aren’t going to even look like trees while we’re around. It doesn’t matter what you pick.